Stop overpaying for SAP licenses. Start managing your licenses based on actual usage. Get the top 8 tips to help you cruise through your next SAP Licensing Audit. Counting active and inactive users, and relying on manual methods for classifying users and assigning SAP license types, does not cut it anymore and takes significant organizational resources. 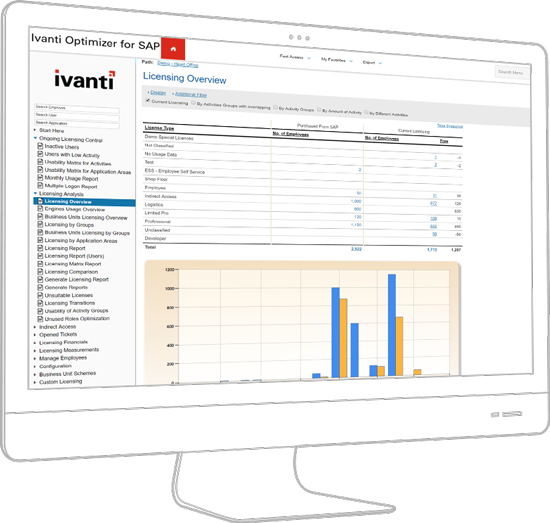 Ivanti Optimizer for SAP provides you with efficient control over your SAP user licenses and automates the license management process while combining user inspection and user behavior-analysis methods, saving you time and resources. Explore 5 simple ways to reduce your SAP License Spending. Reclassification of licenses based on actual user behavior and not based on hypothetical methods or authorization. Identification of inactive and duplicate users for instant savings and reharvesting of licenses. Automatic user-matching across systems and applications to avoid duplicate license counts. Real-time graphical and statistical presentation of SAP license utilization. Detailed audit reports for each user with current and optimized license classification. Automatic analysis based on usage compared to licensing agreement to ensure compliance. 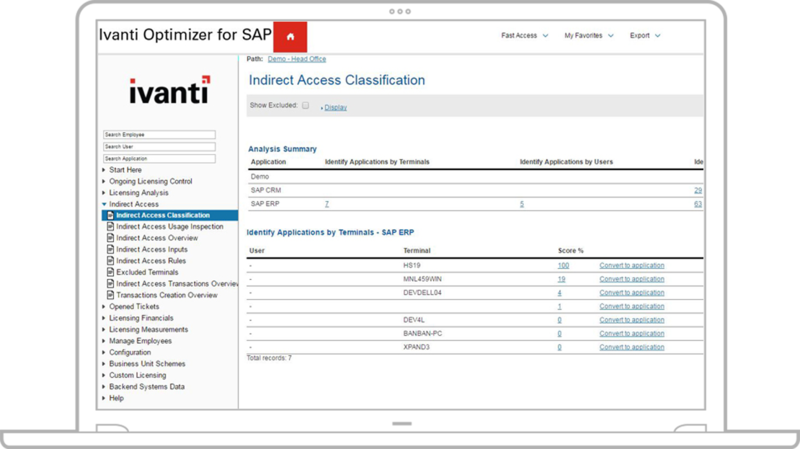 Get the insights you need to start licensing based on your actual utilization of the SAP system and reap immediate benefits from identifying inactive and duplicate users and tackling indirect access. We'd love to help you get the most out of your SAP licenses. We are here to answer any of your SAP license optimization questions. Ready to take the next step and optimize your SAP software investments? Let's talk and find the best solution fit for your business requirements.